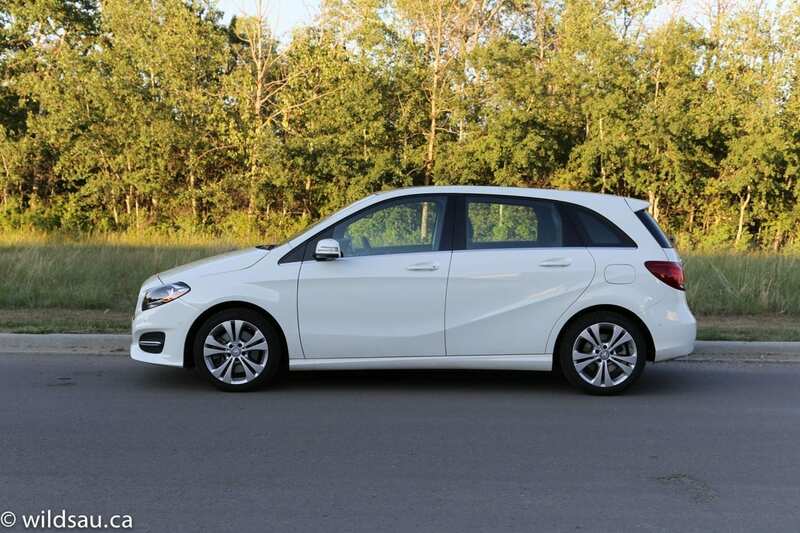 Mercedes-Benz’s most compact North American offering adds the one feature everyone was asking for. 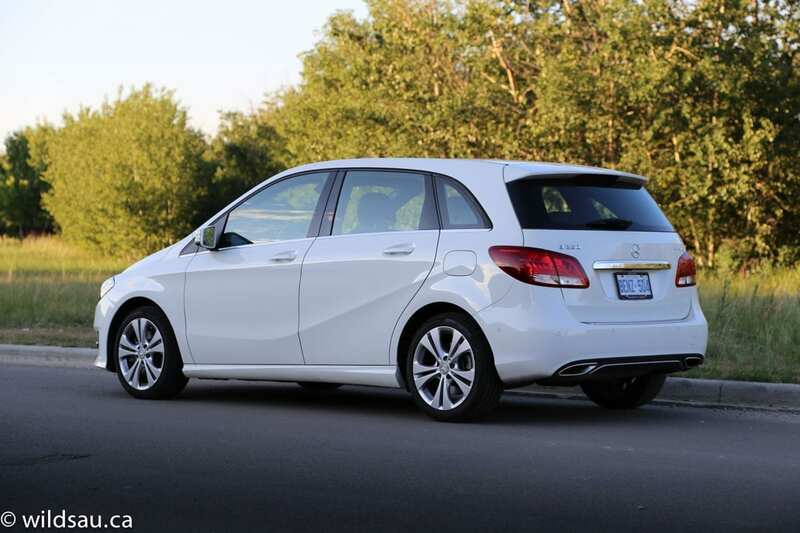 From the outside, it’s difficult to see the changes that Mercedes made to the 2015 B 250, but they’re there. A new front grille and bumper bring some ever so slight refinements, as does the revised rear fascia with integrated exhaust tips. The whole vehicle has grown too – it’s a bit longer, wider and taller now. The changes are nice, but the overall shape remains – it’s a tall 4-door hatchback, which means it’s one of the most efficient shapes in terms of staying small on the outside and having lots of room on the inside. 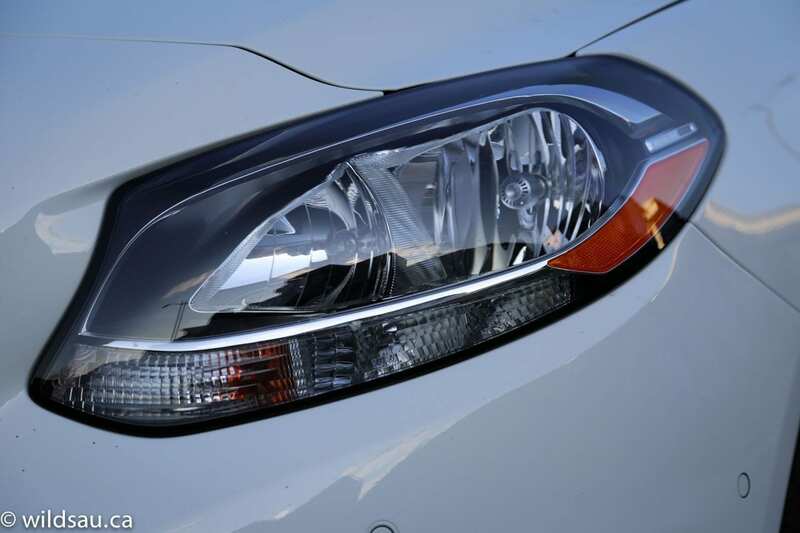 The headlights look less modern than those on our 2014, and lack the slick (optional) LED lighting strips that give it a slightly menacing look as it comes down the street. I liked the 17-inch rims, but the 18-inchers available with the AMG styling packages are spectacular. The inside of the new B 250 looks very familiar as well. A few changes here too – a new steering wheel (which is as great as the one in the previous B), slightly revised gauges (with a beautiful colour information screen between them), power seat adjustment for the driver (with 3 memory positions) and a new 8-inch screen that is bigger and sharper. Frankly, this is one of the best screens I’ve seen and goes well with the COMAND system’s beautifully rendered graphics. 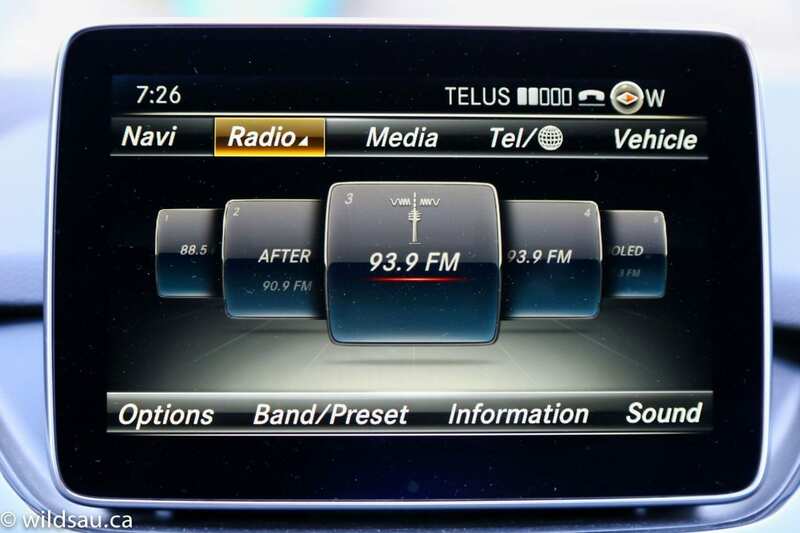 Unfortunately, the interface itself is more complicated and less intuitive to navigate and I found it quite frustrating versus the much more simplified version in the 2014 B 250 I reviewed earlier. Some mild refinements on the centre stack and console, like buttons looking slightly more upscale and aluminum-looking trim around the cupholders, take things up a notch as well. I really liked the optional black ash trim – it’s a handsome addition. The dual overhead sunroof is nice and really makes things brighter and airier in the dark interior. This is one of the B’s trump cards. 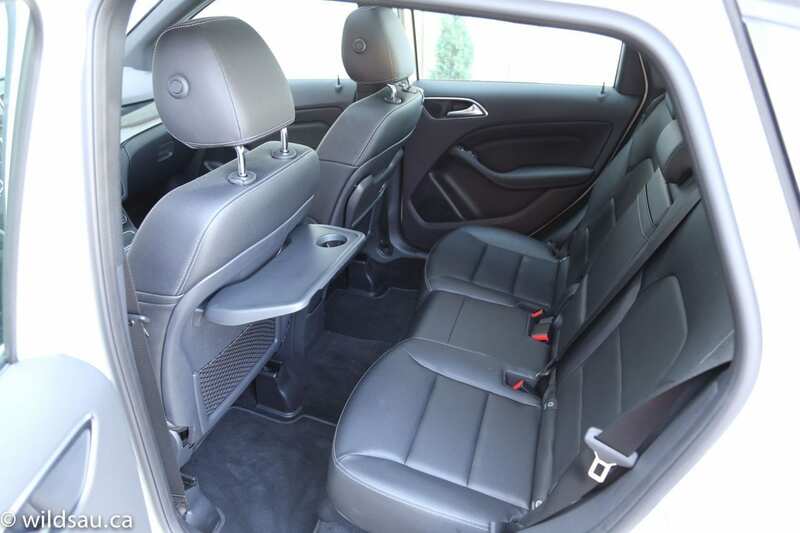 The leg room and head room in the back are astounding, and have surprised nearly every rear passenger we ever transported. 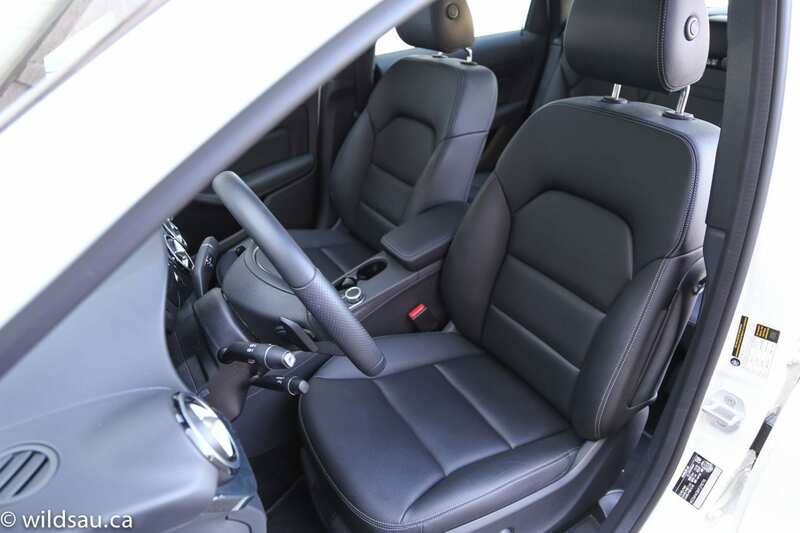 The seats slide fore and aft for some adjustment – this also has an impact on your trunk space. The middle seating position is narrow, and straddles a big floor tunnel. A nifty addition is the two seatback trays – yes, they’re small and kind of flimsy and only have smallish cupholders in them, but our kids were absolutely delighted with them. I can see these going a long way in making a road trip a bit more comfortable for children. Speaking of, our three (who are used to this vehicle’s space since we own a 2014) were comfortable back there, and you get two sets of ISOFIX anchors for child seats. The vehicle is pretty compact but it offers plenty of space in the back. 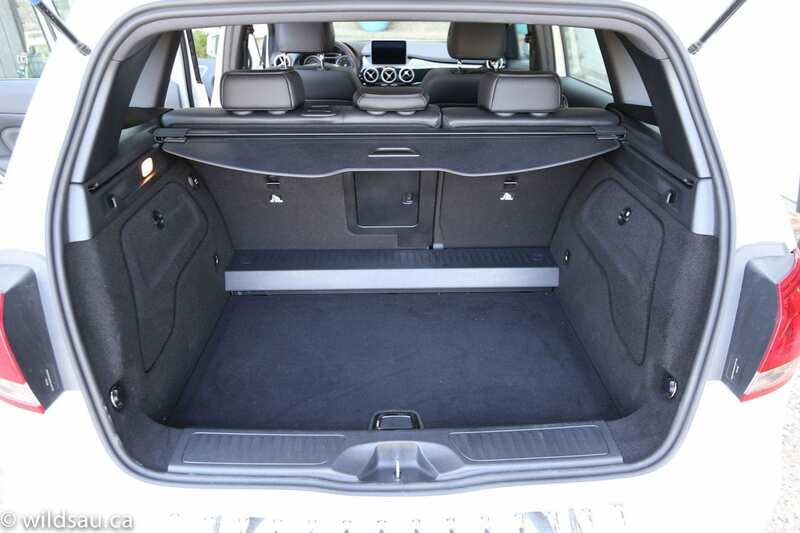 The trunk (at 488 litres) swallows a lot of stuff, and can grow to a stunning 1547 litres with the rear seats down (they fold in a 60/40 split) – that puts it into mid-size crossover territory. There have been no changes to the engine bay. The turbocharged 2.0-litre 4-cylinder (208 HP, 258 lb.ft of torque at only 1200 RPM!) remains the same, as does the 7-speed dual-clutch automatic. 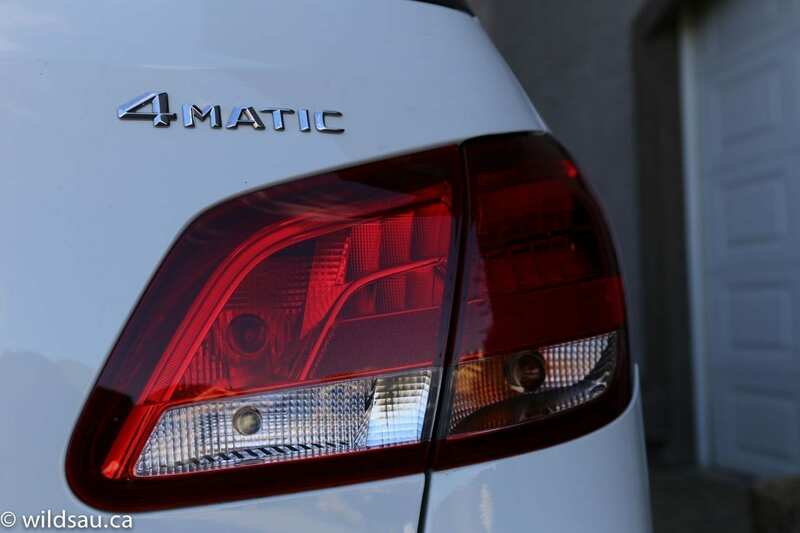 The real news here is the addition of the optional 4MATIC all-wheel drive system. 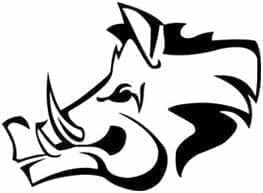 It’s a front-wheel drive based system that engages when it senses a loss of traction. 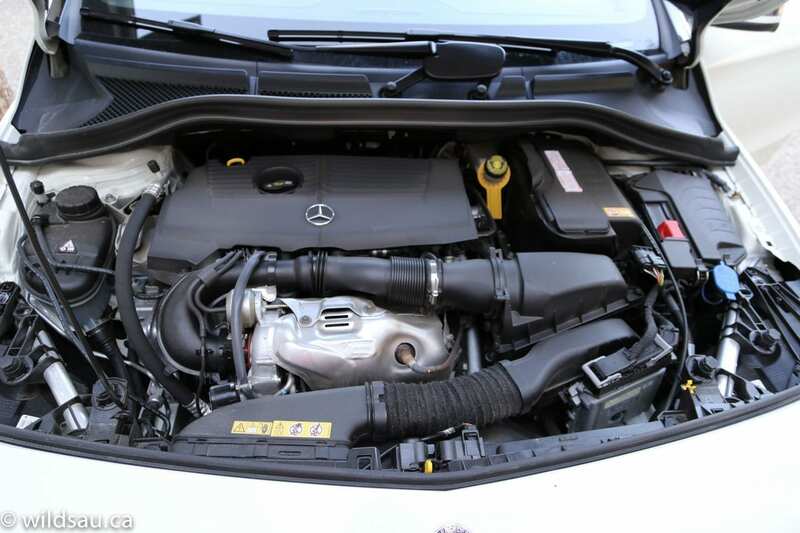 The B 250 is rated at 10.0 L/100 km (24 US mpg) and 7.5 L/100 km (31 US mpg) in the city. I averaged a reasonable 9.2 L/100 km (26 US mpg) during our week with the car. 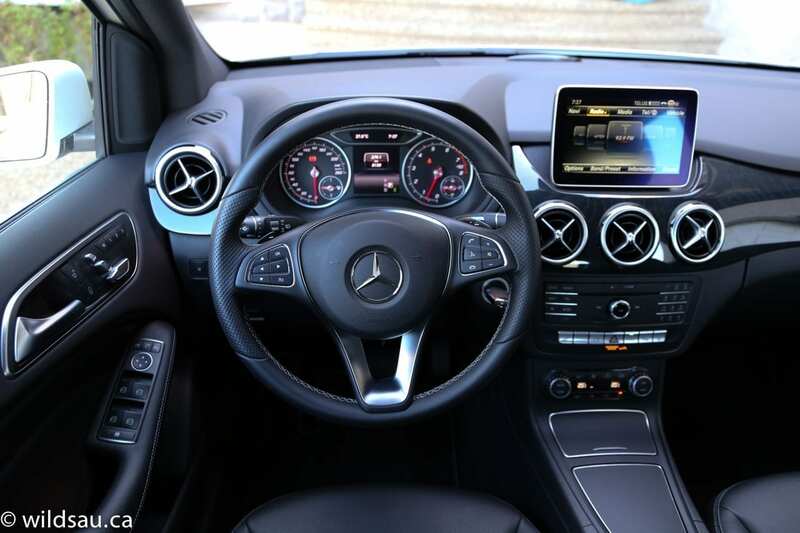 For the most part, driving the 2015 B 250 is exactly like driving the 2014. I sensed some slight coarseness in the drivetrain that I did not feel in the front-wheel drive version, but overall it feels a little more settled and refined than the 2014. There’s plenty of power, but I still feel as though there should be another driving mode between Eco (which is the B’s normal driving mode) and Sport. Eco is really geared toward saving fuel, and you’ll often find yourself wondering where all that torque is when you’re taking off from a stop (unless you step on it, of course) and will be looking down to see that you’re lugging around town at 1100 RPM. 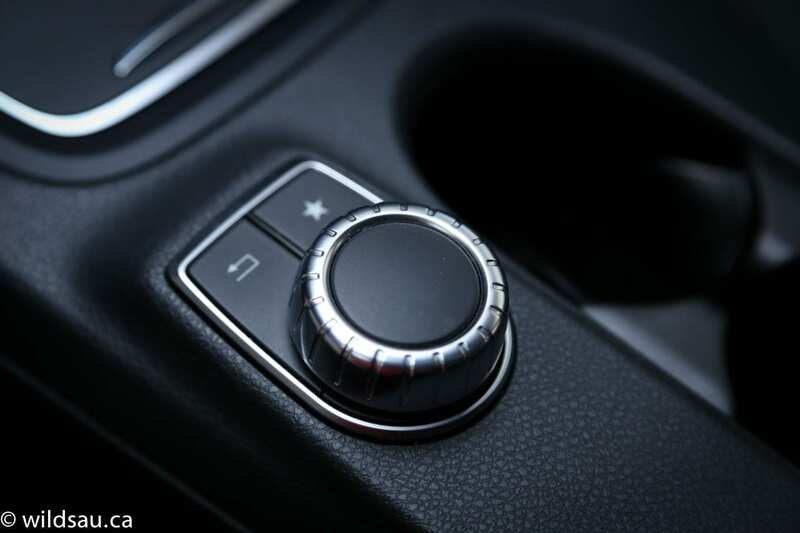 Sport mode, on the other hand, pours it on and is a tad abrupt in some situations. The perfect balance would be somewhere in between. The ride continues to be an issue with the B 250 and that’s mostly the fault of the run-flat tires. 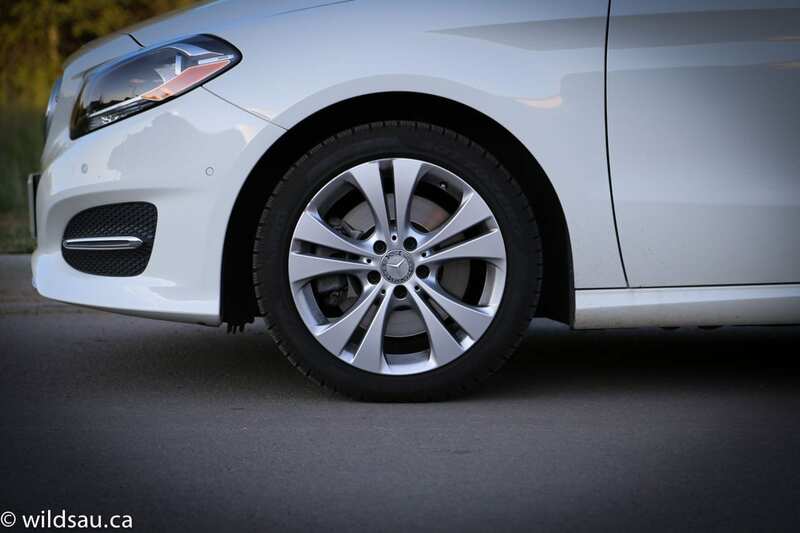 Their super-stiff sidewalls do nothing to help the already firmer suspension, and while the car handles pretty well for what is essentially a tallish wagon, the ride should really be smoother in light of its non-sporting nature. Of note, we have non-run-flat winter tires on our own B 250 and it really has a big (read: fantastic) impact on the ride quality. It’s like a different car, especially over imperfect roads, and has had no measurable effect on the handling capabilities. 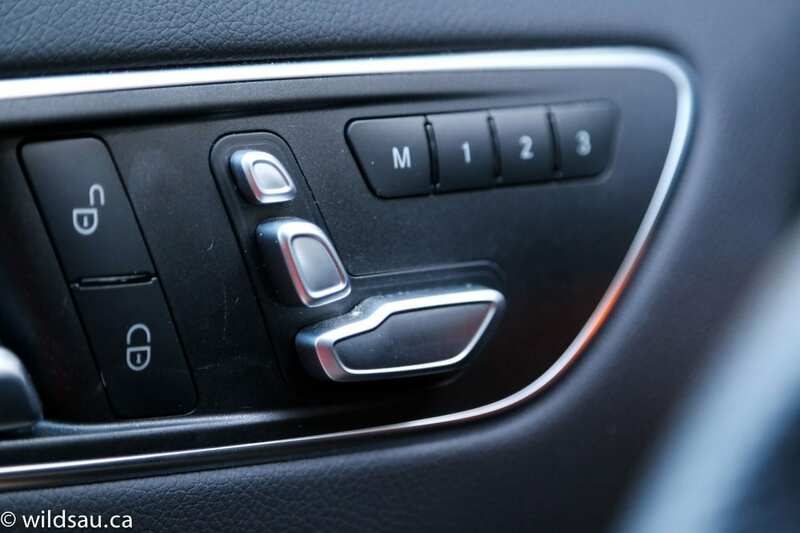 My review B 250 came with a significant amount of driver assistance technology – a rear-view camera with front and rear parking sensors (with audible and visual alerts), blind spot monitoring, PARKTRONIC (active parking assist), collision prevention assist and attention assist. And power-folding mirrors which help in tight parking situations. 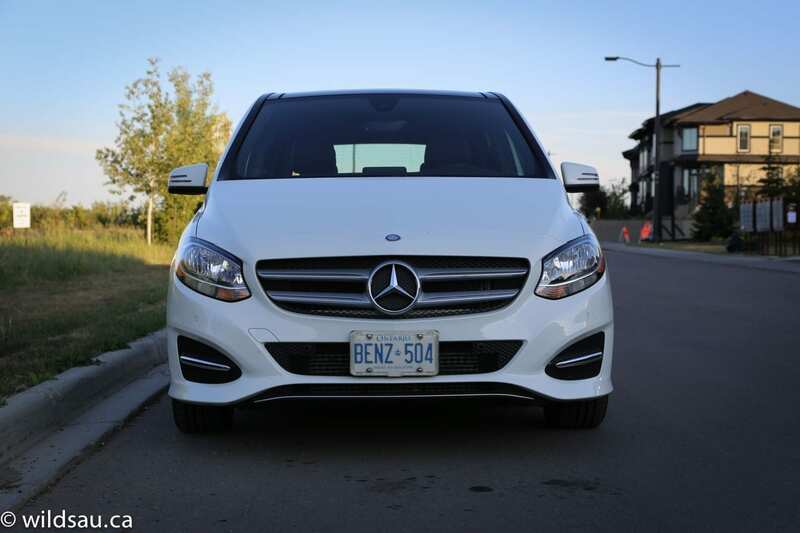 We loved the 2014 B 250 so much that we ended up buying one. That hasn’t changed in over a year of ownership – the car has been flawless for us, and my wife loves driving it every day. It has delivered exactly what we wanted from it. And on that note, my opinion of the 2015 B 250 remains on par with the 2014. We loved it, and we love the fact that it can be had with all-wheel drive now. It was one of my two big wishes – that and a diesel option (European buyers have a bunch to choose from). 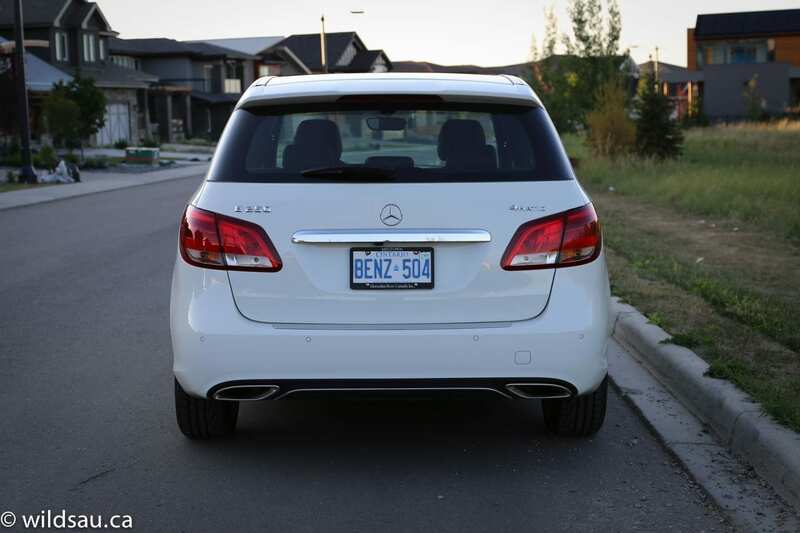 If you read my review of the 2014 B 250, you’ll like have anticipated that the WAF (Wife Acceptance Factor) was sky high. She loved it, as she continues to love owning and driving her 2014. She didn’t have any complaints other than the COMAND system’s over-complicated interface, which left her as confused as it did me. 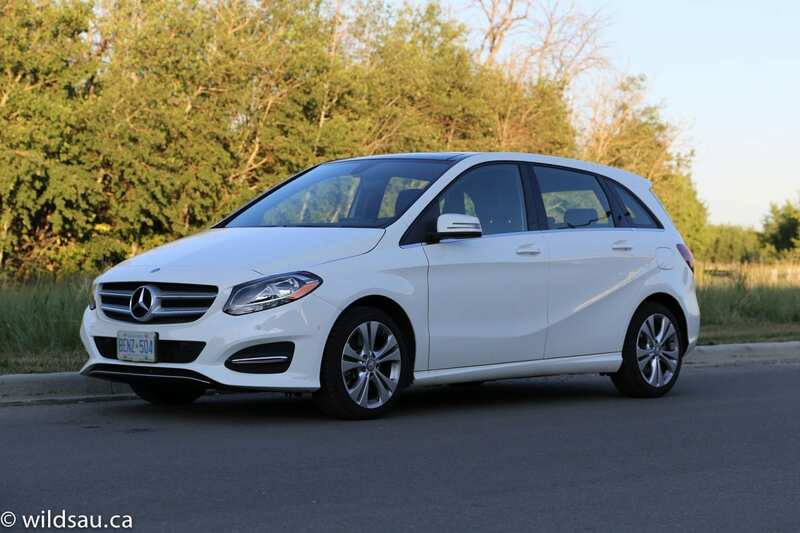 The B 250 is a reasonably-priced way to get into a three-pointed star. It has a premium feel for a small car, and it can be had with plenty of higher-end options and additions that make it a stand-out in this class. Be careful though – as you start checking off those option boxes, the price will also become outstanding in this class.